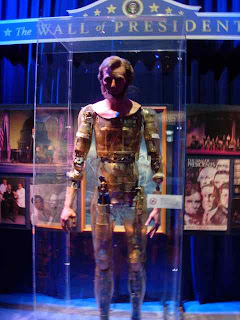 This is the original Abraham Lincoln from Walt Disney's "Great Moments with Mr. Lincoln", which debuted at the New York World's Fair of 1964 and was later brought to Disneyland in 1966. Walt Disney Imagineering had a show area at the D23 Expo where they had some really cool stuff on display, including this section about Audio-Animatronics. There were also previews of the new Disney/Pixar "Cars" attraction, new additions to Hong Kong Disneyland, and the new Disney Vacation Club Resort in Hawaii, called the "Disney Resort at Ko Olina".